When UCLA’s season ended earlier this month, John Savage wanted to make something clear: David Berg was finishing his career as the greatest reliever in college baseball history. Berg certainly has a good argument. On Saturday, he became the only two-time winner of the NCBWA’s Stopper of the Year award, given each year to the top reliever in the country. The Bruins’ star closer had also won during his team’s title run in 2013, when he set an NCAA single-season record with 24 saves. As a senior, he was just as good, also earning him his second Pac-12 Pitcher of the Year award. He only had 13 saves — playing in fewer close games — but was second in the country with a 0.68 ERA. He allowed just one run in conference play, notching a 0.22 ERA in 22 appearances. He paired with eventual first-round pick James Kaprielian for the first no-hitter in school history. Earlier this week, Berg was taken in the fourth round of the MLB Draft by the Chicago Cubs, justifying his decision to turn down a 17th-round selection by the Texas Rangers last year and return for his senior year. Four more UCLA baseball players were picked today to end the 2015 MLB Draft, making for a total of eight Bruins selected. Outfielder Ty Moore, left-handed pitcher Grant Watson, infielder Chris Keck and reliever Tucker Forbes were each drafted, with all of but Forbes going by the end of the 18th round. A day after James Kaprielian became a first-round pick, two more UCLA pitchers were selected in the 2015 MLB Draft. Relievers Cody Poteet and David Berg were drafted in the fourth and sixth round, respectively, joining the Miami Marlins and the Chicago Cubs. They are the latest professional products out of a college program that has become known for its pitching. Berg, picked No. 173 overall by the Cubs, finished his career as arguably the best closer ever in collegiate baseball. Through four seasons as UCLA, the former walk-on set NCAA records in single-season saves (24 in 2013) and career appearances (175). He is the only Bruin to ever be named Pac-12 Pitcher of the Year twice, and was this year’s NCBWA District IX Player of the Year. Drafted in the 17th round last season, the submariner returned for his senior season and registered a 0.68 ERA, third-best nationally. Last month, he paired with Kaprielian for the first no-hitter in school history. This evening, UCLA baseball will likely produce a first-round draft pick for the first time in four years. 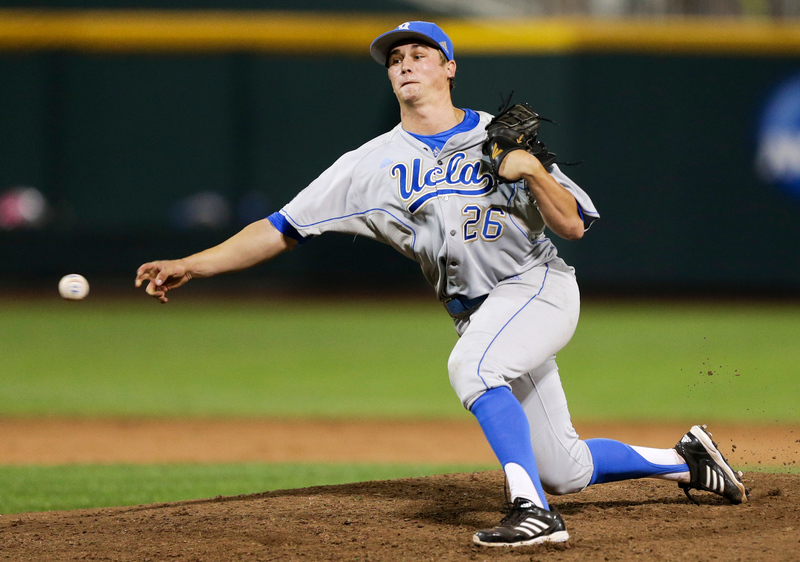 Right-handed pitcher James Kaprielian, the Bruins’ Friday ace for the past two seasons, is projected to go off the board early in the MLB draft, which starts today at 4 p.m. PT. As a junior, the 6-foot-4 prospect led the Pac-12 with 114 strikeouts, and combined with closer David Berg for the first no-hitter in UCLA history. Teams had expressed interest in drafting Kaprielian (10-4, 2.03) in the first two rounds in 2012, but Kaprielian product was set on attending UCLA. He was eventually taken in the 40th round by the Seattle Mariners, and became a reliever on the Bruins’ 2013 national title team as a freshman. UCLA coach John Savage said that Kaprielian was somewhat underrecruited coming out Beckman High in Irvine, calling him a “football guy” who slipped through the cracks. That he wasn’t a big factor on the travel circuit suppressed his stock too. Based on numerous mock drafts, Kaprielian appears to be a lock for the first round. He is projected to go No. 10 overall by Sports Illustrated, No. 12 by ESPN, and No. 16 by Baseball America and MLB.com. The last time a UCLA player was drafted in the first round was 2011, when pitchers Gerrit Cole and Trevor Bauer went first and third overall, respectively. For the second straight year, the No. 1 overall seed couldn’t make it out of the NCAA Regionals. This year, UCLA baseball was the one that fell, following Oregon State as the second straight tournament favorite to bow out early. In an elimination game against Maryland, the Bruins couldn’t scratch together enough offense in a 2-1 loss. Click through to read the full game story from Jackie Robinson Stadium tonight.